SOFTLINE 70AD it’s a 5-chamber profile with a basic overall depth of 70 mm, with rounded and classic edges. The system has special properties, being perfect for any climatic region. SOFTLINE 70AD offers the best value for money. SOFTLINE 70AD design with slightly rounded edges, well-proportioned lines, harmonizes in a perfect way with various architectural styles, modern or traditional, whether it’s a new or a renovated building. Float Glass – a glass without thermal properties, used predominantly in rooms that do not have direct contact with the exterior. The main advantage is given by the maximum brightness it offers. Low-E Glass – low emissivity glass. The Low-E window is enriched with very fine silver particles and rejects 71% of sunrays. Though it is pricier than a clear double-glazed window, it’s even more efficient and it’s being used in proportion of 55-60% in thermo-insulating glass joinery orders. 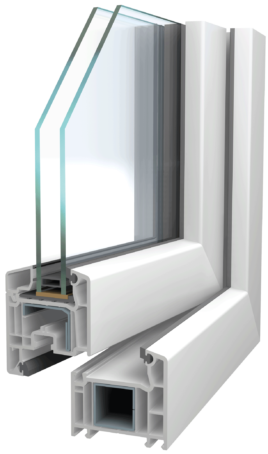 This type of glass provides the minimum insulating protection we recommend in windows projection. We also recommend using Argon filling between the glass sheets, for both thermal and acoustic benefits for your house. Low-E 4S Glass – represents the next level of glazing after Low E Glass, being improved with an external reflective window film. It combines the Low-E glass role of keeping the warm inside the house but also the properties of the reflective glass, to reject the UV rays. Using this type of glass you will avoid the greenhouse effect, created when using ordinary glass. We recommend using this type of glass for houses over which the sun shines most of the day. Duplex Glass– represents 2 combined sheets of glass, glued together, ensuring high intrusion protection. The existing duplex types are Duplex 3.3.1, which contains two glass sheets of 3 mm glued together, and if the duplex is made up of two sheets of at least 4 mm, we can consider this type as an anti-burglary glass. If we also want thermal protection from this type of glass, then one of the two glass sheets should be Low-E, resulting in Duplex 3.3.1-Low-E, Duplex 4.4.1 Low-E etc. Wrong counteraction – parts assembled both on the doorjamb and the sash to allow the window to open from one direction to another, only if the window is in the correct position. For example, when the window is opened in a normal position, you can’t open it as a tilt and turn window, like most of the windows act, avoiding the risk that the window remains suspended in one hinge. Partial ventilation piece (micro ventilation) – a piece placed on the casement beside the top lock ensuring natural ventilation without keeping the window open (after leaving the handle halfway between the normal opening and the oscillator, the window won’t close tightly). Condensation, mold and moisture are avoided. Anti-blocking locks – the blockers have the shape of a mushroom-head and are used to protect the house from intrusion attempts. Secustik Handles – designed by the largest handles manufacturer, Hoppe, whose products are distinguished by: the click sound of the handles at each 45 degrees, anti-burglary protection through a special mechanism that prevents the window’s handle to be opened from outside, fully metal core, well defined for the micro ventilation system. *The colours shown are standard. On request, any type of special colour can be applied. Possibility of colouring in nearly 50 shades or wood imitations, on both sides or only on the outside or the inside.